These are the four factors that commonly pressured us and give us STRESS. Hassles, Frustrations, Demands and Deadlines. It's "ME TIME" once again, meaning I have to pamper myself. To re-charge my batteries in order to gain my mental health and life's happiness. And the good way to PAMPER YOURSELF is by going to a SALON or CALL FOR A BEAUTY HOME SERVICE. Heading to a salon or have a beauty home service call occasionally for a manicure/pedicure and hair color won't deplete your bank savings. And who loves SHOPPING? This is the best ways to unwind after a stressful day. 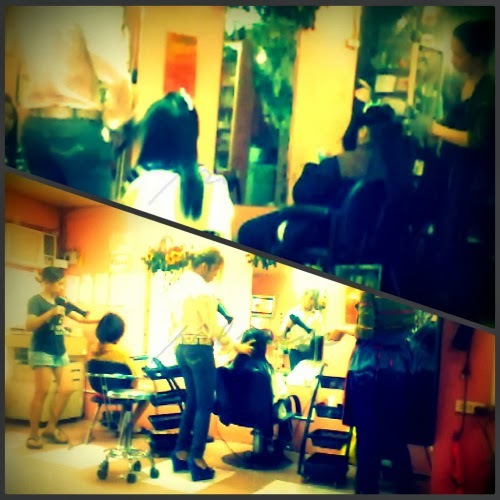 With my experience, going to a salon is my way of taking out my whole day life from a hard day tasks. Person: I love your hair color. Where do you get it done? Person: Love your hair so much! Basically this is my exchange of communication with everyone who compliments my hair color. 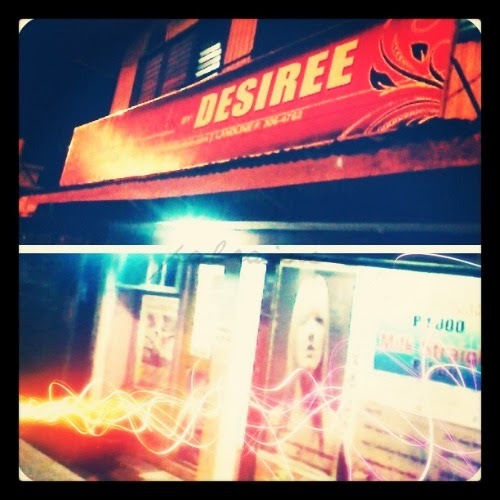 Make to believe that a typical beauty salon situated right at the corner of Rizal Ext. and Quezon Blvd., a gem hiding in Davao City. The place is so relaxing,a bit of a classy ambiance with a super welcoming busy owner and staff's. I'm an Asian woman with black/reddish brown hair and I wanted to step out from my boring hair color which I have since my 20's. Now that I am in my 30's I wanted to try something different-BLONDE! A bit skeptical to have my hair done with this color. I explained it to Desiree and she completely understood, want my hair to look as NATURAL as possible without clashing it with my skin tone. 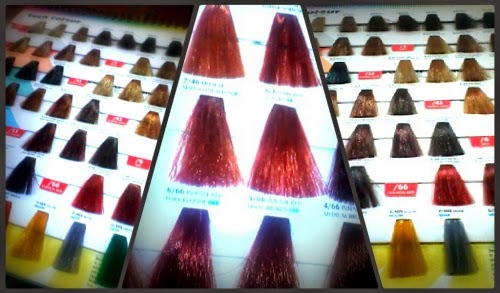 She handed me the Hair Color Book. 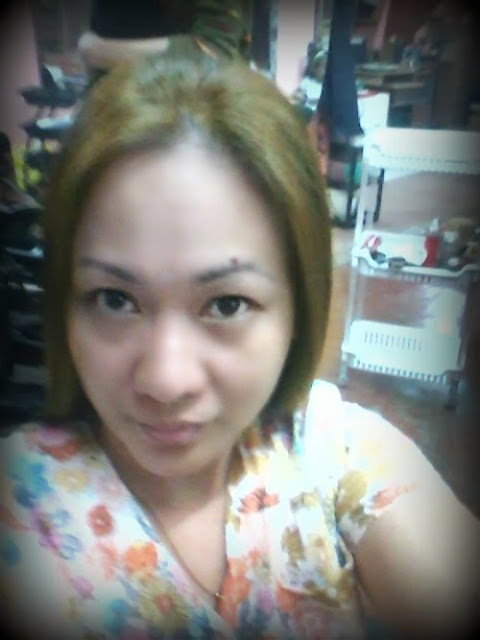 Got confused what kind of a blonde color shall I choose that will look natural to my hair. 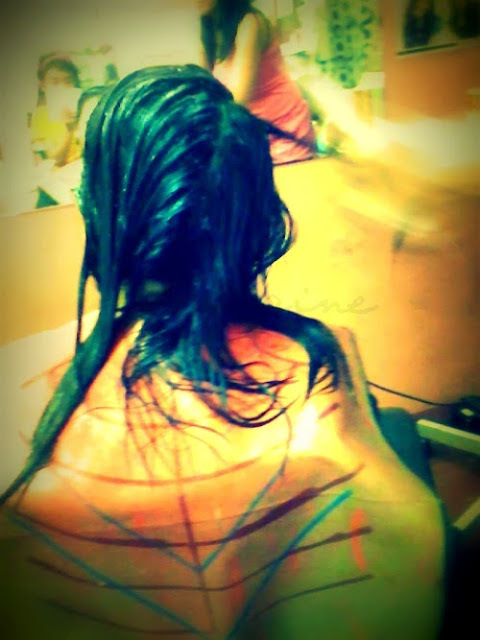 I call Desiree's attention and she stepped back, took a look at my hair, and got to work. She is a very super chill owner, has the right balance of being talkative but reserved to her client's. 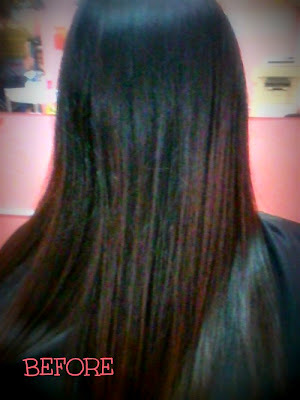 Love the Hair and Scalp Spa Treatment, they use cool mint menthol that is soothing to your hair and scalp. A full scalp massage leaves your hair feeling refreshingly clean shields hair from waterborne elements that can irritate and compound scalp. 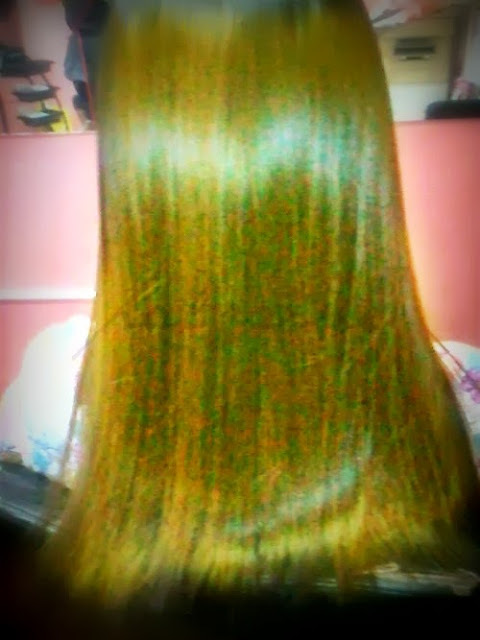 The hair result? So loooove it! DESIREE does my hair and she is excellent. No wonder she is called as the hair lead stylist. They usually work one person at a time, that is why because she is so popular that I have to make an appointment ahead of time. My hair is so happy with that arrangement though. 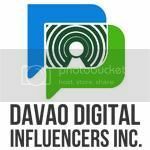 The service cost only PHp500. Personally, I found it to be a fair price. So cheap. 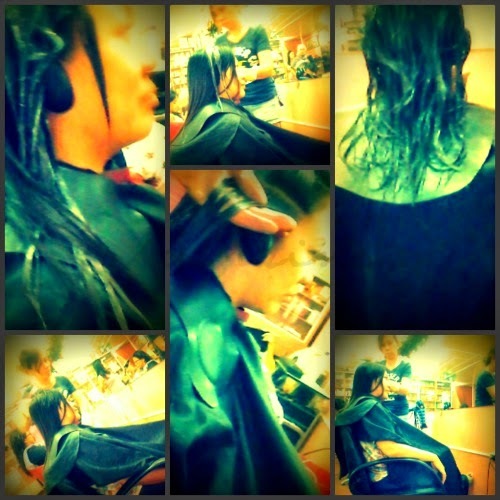 You get what you pay for, and you're gonna be walking glamorously oomph as you step out from the salon. By the way, they offer FREE Wi-Fi. I am in dire need to have my manicure/pedicure. So I call Aling Bebeng to have a service at our home. 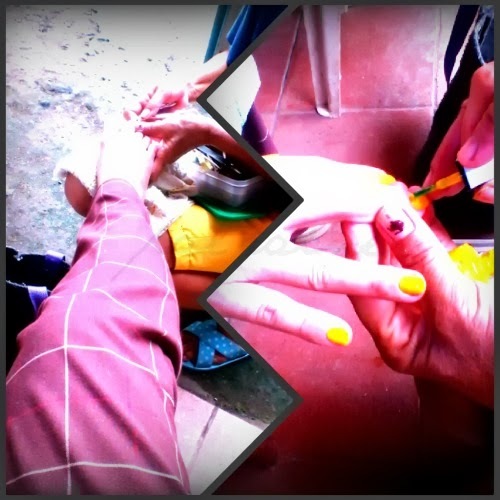 After the traditional prepping of the toes, trimming up my cuticles, scraping away dead skin and squaring off the toe and finger nails, soaking and drying the skin, I was ready to select my nail color. 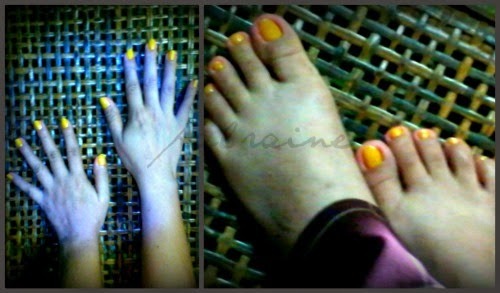 And for the first time, I choose YELLOW nail color. Absolutely love my nails now! Just in a day I've done pampering myself from head to toe. 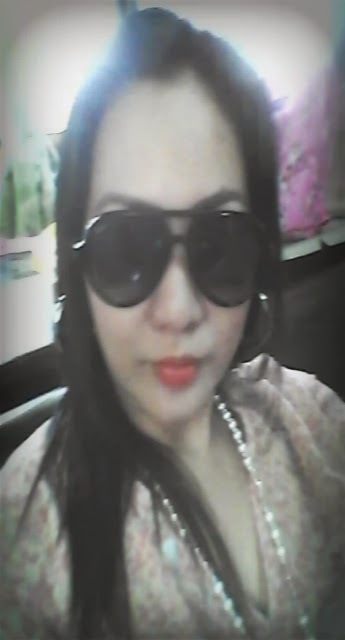 Before that I already pampered my eyes by buying a new pair of a RAY-BAN. Weeehhh! Addicted to it, this is my second RAY-BAN sunglasses. Bought it at SM CITY DAVAO Department Store. 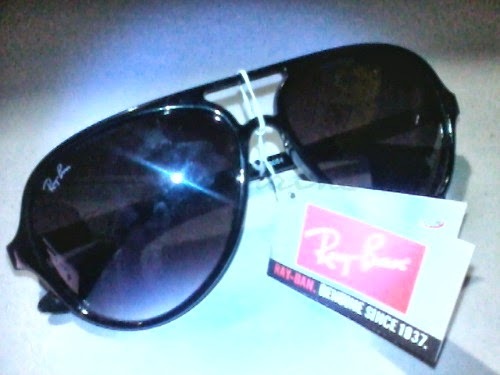 By the way, my first RAY-BAN I bought it online (story here). Now your LIFE will probably never be a stressful as it is. If you will just take yourself a BREAK. Have a blast of FUN in a day, make yourself HAPPY, even if it's just for a few minutes. Just move. Have Fun doing it. We definitely need a little pamper here and there to help relax us from time to time. I like that! AS much as I want to take a day off I would rather spend quality time with my family. I am a SAHM with no helper. I like the hair color by the way. Awesome! What a fun time that must have been! That is a nice color...which reminds me....I need some me time as well. Your hair color looks great! 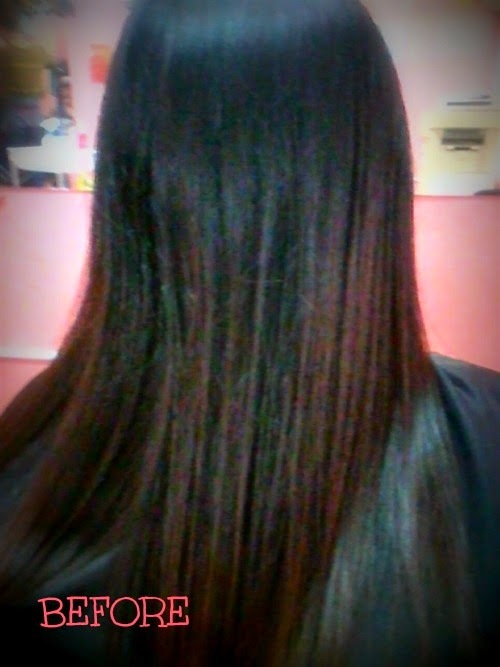 I love getting my hair done, it is the only time I usually do something for myself. Wow...your hair looks great! It really is a nice even tone to complement your great complexion too! A little 'me-time' at the spa, salon is always much welcome!